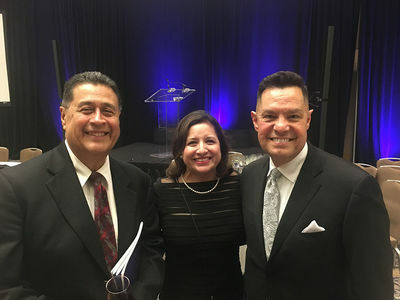 Luis Fraga (second from right), with (from left) ILS Advisory Council member Phil Fuentes; Fraga’s wife, Charlene Aguilar; and ILS Advisory Council member Joe Power. 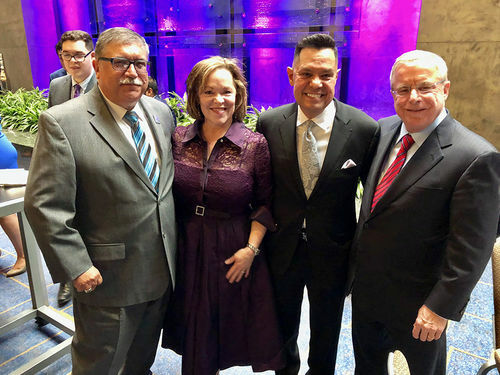 Luis Ricardo Fraga, director of the Institute for Latino Studies, has received a lifetime achievement award for excellence in community service from the Mexican American Legal Defense and Educational Fund (MALDEF). Founded in 1968, the Los Angeles-based MALDEF is the leading Latino legal civil rights organization in the United States. Fraga received the honor from the organization in recognition of his continued work serving students as well as the community and his efforts to bring these two groups together. Fraga has contributed research to lawsuits filed by MALDEF and other civil rights organizations, such as the NAACP and ACLU, on numerous cases, including work on the 1965 Voting Rights Act with Chandler Davidson,research professor and Tsanoff Chair of Public Affairs Emeritus at Rice University. Through that legal work, Fraga learned how academic research could be used to make influential decisions within the court system. “What we do as scholars isn’t just research for research’s sake if we can apply our work to affecting people’s lives to help democracy become stronger,” Fraga said. His research has had an invaluable impact, enabling important court cases to be decided in favor of those being marginalized. Fraga has provided expert testimony in voting rights cases in California and Washington. Working with the New Language Program (ENL) through Notre Dame’s Alliance for Catholic Education, Fraga helped establish the first-ever Spanish-English, two-way immersion program in a Catholic school in the Diocese of Fort-Wayne-South Bend at Holy Cross School in South Bend. Fraga also collaborated with the Notre Dame Office of the Provost to bring the Warrior-Scholar Project to campus. This program provides a one-week academic boot camp enrichment opportunity to military veterans and those planning to leave military service. This program further strengthens the University’s commitment to the armed forces and to share its resources with those who have given to this country, just as Fraga’s father did through his Navy service during World War II. Fraga with founding ILS director Gil Cardenas (left) and his wife, Dolores Garcia. Previous winners of the MALDEF excellence in community service award include Dolores Huerta, co-founder of the National Farm Workers Association and president of the Dolores Huerta Foundation; Brent A. Wilkes, former CEO of United Latin American Citizens; Cynthia Telles, director of the UCLA Spanish-Speaking Psychosocial Clinic; and Paul Schrade, coordinator of the RFK-12 Community Task Force. A native of Corpus Christi, Texas, Fraga has spent his career bringing a distinct and enriching voice to the intellectual capacities of universities across the country, enabling them to better serve all students — including those whom universities are not accustomed to serving in their research and teaching. Fraga also works to inspire transformative leaders who he encourages to use their values and vision to serve those who are not traditionally served and find inspiration for a bigger, more inclusive future. He has served on the Notre Dame Task Force on DACAmented and Undocumented Students to support cohorts of undergraduate students otherwise overlooked. ILS’ Transformative Latino Leadership Lecture series was initiated by Fraga with the goal of engaging prominent figures in politics, entertainment, the arts, business, activism, the church, and other fields. These influential leaders present both their personal experiences and a vision of effective leadership in their sphere of influence with the goal of inspiring and informing young leaders about the possibilities, pitfalls, and principles they should know as leaders in our contemporary world. 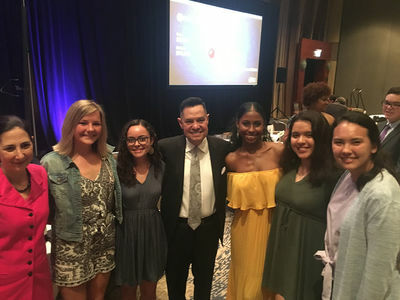 Fraga with (far left) Karen Richman, ILS director of undergraduate studies; and students interning in the Cross Cultural Leadership Program in Chicago. Helping students “understand the public consequences of their private decisions” has been a goal of Fraga’s. He also allows this lesson to guide his own work, using his knowledge, resources, and support to give back. “Someone who has had as many privileges as I’ve had carries a great deal of responsibility,” he said. A graduate of Harvard University, Fraga received his master’s degree and Ph.D. in political science from Rice University. His primary research interests are in American politics, where he specializes in the politics of race and ethnicity, Latino politics, immigration policy, education politics, voting rights policy, and urban politics. Fraga’s two recent books highlight this research, the co-authored Latino Lives in America: Making It Home and United States Government: Principles in Practice,a high school textbook. Fraga was one of six principal investigators on the Latino National Survey (LNS), the first-ever state-stratified survey of Latinos in the U.S. This survey explores questions regarding political attitudes, beliefs, behavior, and policy preferences. In 2011, Fraga was named one of the top “100 Influentials” in the U.S. by Hispanic Business magazine and served as a member of Barak Obama’s President’s Advisory Commission on Educational Excellence for Hispanics. Fraga is currently the acting chair of the Department of Political Science, the Notre Dame Professor of Transformative Latino Leadership, the Joseph and Elizabeth Robbie Professor of Political Science, and a fellow in the Institute for Educational Initiatives. He has previously served on the faculty at the University of Washington, Stanford University, and the University of Oklahoma. All of Fraga’s work intimately aligns with the mission of the Institute for Latino Studies and the University of Notre Dame by advancing the understanding of the fastest-growing and youngest population in the United States and the U.S. Catholic Church and preparing transformative leaders in all disciplines of study. Originally published by Lauren Melancon at latinostudies.nd.edu on June 21, 2018.